Ringin BALLANTYNE was the son of the late Ninian BALLANTYNE and of Mrs Jane Gray (nee HAMILTON) BALLANTYNE, of Oamaru. 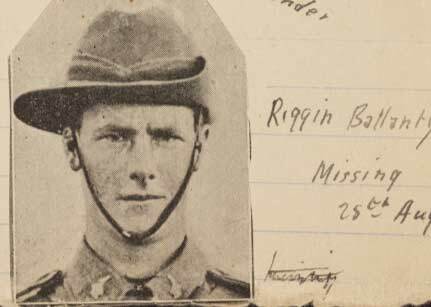 he was first reported missing on 28 August 1915, then reported killed. Ringin was one of two men originating from the Fairlie district to suffer the same fate in the same battle on the same date, the other being Edgar Joseph Keefe. Ringan is remembered on a marble tablet erected in memory of those who renedered service to their country in time of peril and which was unveiled at Hunter on 2 October 1919.